Joe Davis State Park on the lower Niagara River, just north of the Village of Lewiston. Economic development professionals have long wondered why Niagara County's waterfront hasn't emerged more quickly as tourist destinations for downstate residents and Canadians. The lot at Joe Davis, paved less than two years ago, has failed spectacularly. The Joseph Davis State Park is under a lease agreement with the Town of Lewiston and managed by a Local Development Corp on behalf of the town. More than $1,000,000 has spent to date by the town on the park. Among these expenditures was the paving of two parking lots in the park. 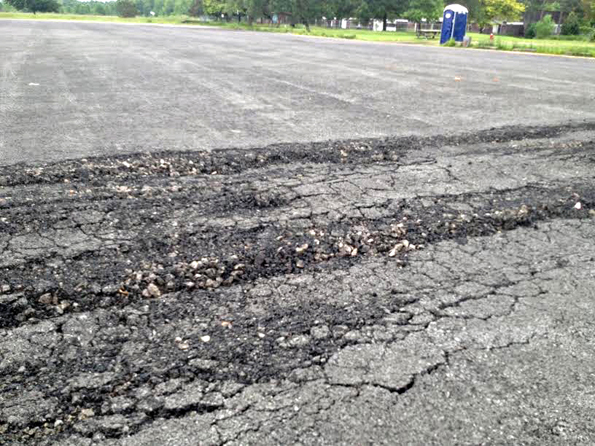 Reports that that parking lot, paved in 2012, had failed led me to the park last week. I have some, but not very extensive, knowledge of paving having built two public roads in the 1980’s. Arriving at the site, I found that portions of the lot had indeed failed and there were depressions seemingly caused by truck or car traffic. Why did a two-year-old parking lot fail this seriously? 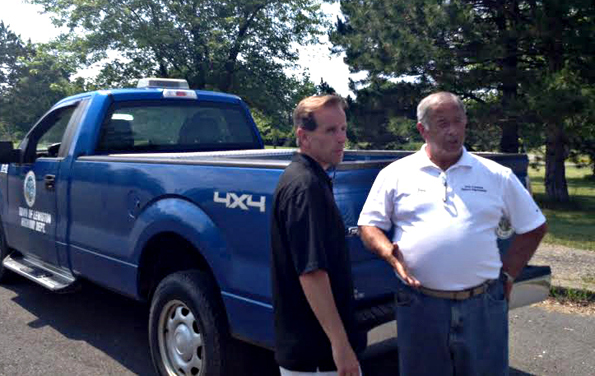 Councilman Mike Mara and Town Highway Superintendant Doug Janese inspect the failed paving at Joe Davis Park. I filed a FOIL request with the town to see what the bids were and who did the work. There were three bids submitted in August 2012 for the paving job at Joseph Davis. All three had the same specifications which were to apply 2.5 inches of asphalt compacted to 2 inches. That means the contractor was to lay down 2.5 inches thick of asphalt and, then with rollers, pack it down to get the air out leaving a dense layer of asphalt pavement at a depth of two inches. The lot was 192,000 square feet. The bid from Rustin Paving came in at $236,160. The tape doesn’t lie. Repeatedly, the tape measured asphalt at the parking lot that measured less than two inches in thickness. 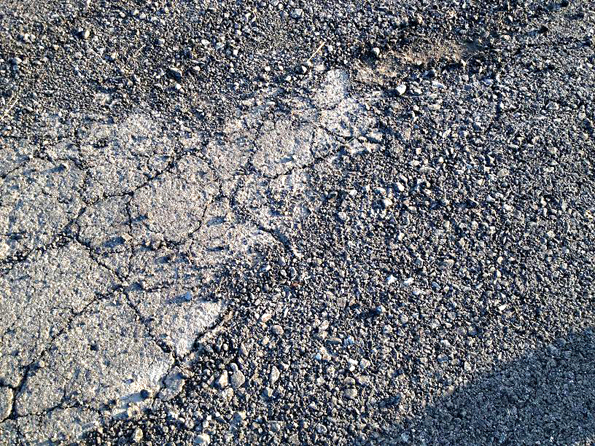 (Above) Here the asphalt is less than an inch. 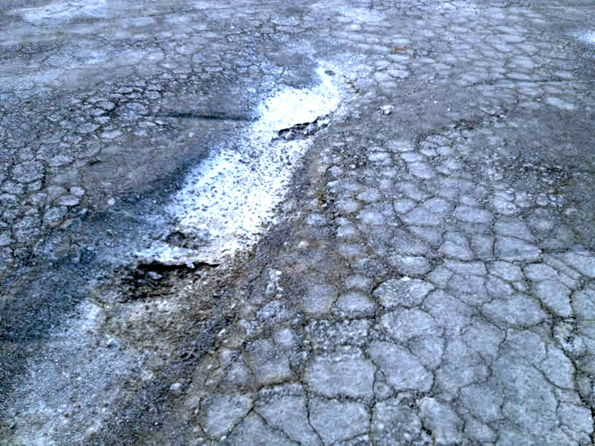 (Below) There are places where no asphalt was applied at all. Ken Young Paving came in at $189,000. According to the Joseph Davis State Park Local Development Authority resolution dated Aug. 20, Young paving was awarded the contract for $189,000. By my calculations in order to get 2.5 inches of asphalt spread over 192,000 square feet compacted to two inches, it would take nearly 3,000 tons (2,955) of asphalt. The price in 2012, according to sources I contacted, was between $60-63 per ton, making the cost of asphalt on this job around $180,000. How did Young come in at $189,000 if the cost of materials alone was $180,000? The other bids were $33,000 and $47,000 higher, at $221,000 and $236,000, which is what one would expect a price to be if material cost is $180,000. The job itself is not a long job. It could be done in a day with a good team. Cerrone and Rustin, the other two bidders, are well known for competitive and accurate bidding. Why were they 25 percent more than Young? The simple act of a car or truck driving on the pavement should not have done this to the lot. Was less asphalt put on than promised? The town is going to find out. Why would Young bid it at what is virtually the cost of materials? He had fuel, the cost of mobilizing equipment, the cost of maybe 10 men to do the job. At the price he bid it, it seems, he would have lost money. Returning to the Joe Davis parking lot, I took more than a dozen samples of asphalt where the lot had failed and measured it with a ruler. Nowhere did I find the two inches of compacted asphalt as required in the contract. In most places there was an inch or less. Some places had less than half an inch. In fact there were bald areas where there was no asphalt laid at all. If the rest of the lot was similar to these samples, the town – which funded this job-had been shortchanged by, on average, more than an inch of material. And an inch less of material would mean the contractor laid down only 1,773 tons of asphalt. The difference is 1,182 tons saved per inch. At 2012 prices that would have meant the contractor saved $70,900, if he skimped an inch, based on my calculations. I called the contractor, Ken Young, to ask him. I called him four times over the next four days. He did not return my calls. I called former Supervisor Steven L. Reiter, who had been in charge of the Joe Davis Park project when he was supervisor. In fact it was he who negotiated the deal with the state for the town to take over the park and use Greenway and other public money to improve it. He was supervisor when this paving work was done. In fact he had decided originally that the lot should be paved. When I asked about the paving job, its failure and what I suspected was the thinness of the asphalt, Reiter, who had been highway superintendent for 10 years before becoming supervisor, said he did not inspect the job. In fact no one inspected the job, he said. He trusted Ken Young, he said, to do it correctly. Since he was a highway superintendant and had paved literally miles of roads I asked Reiter to come to Joe Davis Park to take measurements. Reiter added that, while town jobs were inspected carefully, no one inspected the job for the town or the LDC despite the job being done with public money. Ken Young Paving had, prior to paving Joe Davis Park, paved the parking lot of Reiter’s mother’s property, where the Hill-Vue Cafe and the De La Casa restaurant are located, on the corner of Rt. 104 and Model City Rd. Reiter said his mother paid “$50,000 or $60,000 ” for the job. After speaking with Reiter, I contacted Town Councilman Michael Mara and Highway Supt. Doug Janese and asked if they would meet me at Joe Davis Park. If anybody would know about asphalt, it was Janese. As highway superintendant, he had installed miles of pavement for the town. 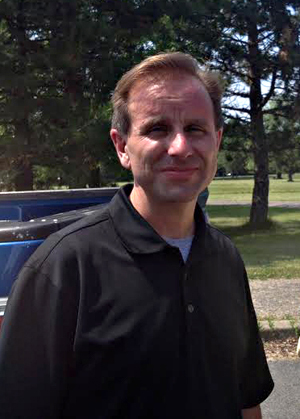 At the park, Janese explained the paving job at Joe Davis was authorized by the LDC and that he was not asked to inspect it and that he had no input in the job. Janese said that asphalt was about $61 per ton in 2012. He estimated that, based on 192,000 square feet, every inch would need around 1,100 tons of asphalt. Councilman Mara and Janese inspected the pavement. Janese, with his ruler, measured about a dozen samples. “Based on the samples, nothing I have tested has two inches or close to it,” Janese concluded. “We have anywhere between half an inch to an inch and a quarter. “If this lot hadn’t failed, no one would have known that you might have less material. The failure exposed the lack of material,” Janese said. “In the spots we checked there was not the material laid down that was in the contract. The ruler did not lie to us. After examining several samples himself, Mara said, “I agree with Doug. There is enough here to warrant further inquiry. I would say this warrants an expert in the field to have a look at it and report back officially to the town board. It seems possible from what I have seen that there is less than two inches of asphalt here. But we want to get an expert out here to officially test it,” Mara said. “I want to get a trusted expert to let us know exactly what was done and what wasn’t done. Janese recommended the town send the town engineer, Bob Lannon, to conduct core samples. 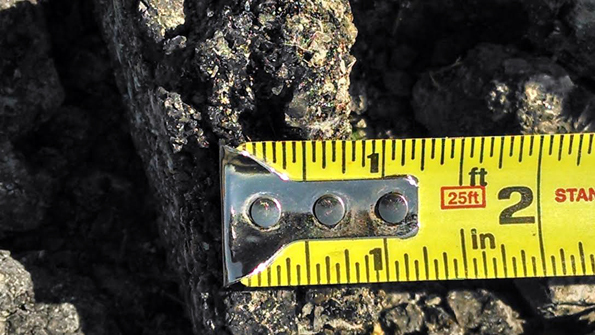 When contacted by phone, Supervisor Dennis Brochey agreed that the town engineer should do tests to see if the contracted amount of asphalt was laid down. In the interest of fairness, we ask the public not to jump to hasty conclusions. According to two members of the town board, tests will be taken to determine if the town was shorted. The Reporter attempted to reach Ken Young repeatedly. He has not told his side of the story. Further testing may prove something other than what the two dozen samples taken by Janese and myself have shown. One thing is certain, whatever was laid down two years ago is still there and can be accurately measured. Asphalt doesn’t disappear or wash away with the rain. If Ken Young Paving laid down the amount contracted or less, the public will soon know. This one will be easy to prove. Councilman Mike Mara says he will seek an investigation.